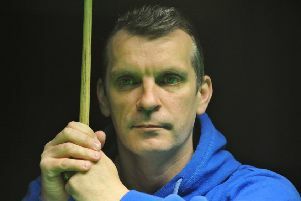 Mark Davis narrowly defeated Jimmy Robertson in the battle of the locality’s two snooker stars at the Coral World Grand Prix. St Leonards-based Davis recovered from 2-0 and 3-2 down to edge past Robertson, from Bexhill, 4-3 in round one at Cheltenham Racecourse this afternoon (Tuesday). World number 35 Davis scored just seven points in the opening two frames as 23rd-ranked Robertson comfortably clinched them both with a top break of 55. Davis edged a tight third frame, however, to open his account and won the fourth without conceding a point to level at 2-2. European Masters champion Robertson replied in kind by clinching frame five with a splendid break of 119, but Davis took the next to level once again before winning the decider 63-8 with a run of 61 - his highest of the match. English Open runner-up Davis will face 24th-ranked Chinese cueman Xiao Guodong, conqueror of Neil Robertson, in the last 16 of the ITV4-televised event.